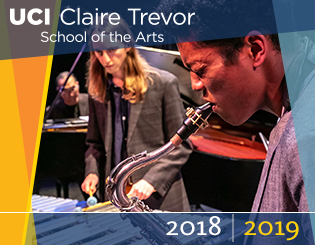 Claire Trevor School of the Arts is UCI’s center for innovative, creative engagement in art in all of its facets: production, critique, appreciation, and development. The School’s work focuses on creativity—but not just on creativity: our mission integrates all levels of education (from B.A. and B.F.A. to M.F.A. to Ph.D.) with arts advocacy and leadership, engagement with social and cultural issues, and partnerships with individuals and organizations locally, nationally, and internationally. We conceive our mission as an audacious one: our passion is exploration, seeking new ways to develop existing talents and skills and to create new methodologies and tools to craft an environment in which innovation is a constant. UCI believes in this vision in a variety of ways and through a variety of disciplines; CTSA engages in collaborations with colleagues and programs across the campus, in the humanities, the sciences, computer technology, engineering, medicine, transforming the teaching and practice of creative work. We are very clear in our educational mission. As part of a renown academic institution, CTSA undergraduate programs are grounded in the liberal arts model through which students learn to unite their creative activity with the development of critical thinking and writing skills, engagement in research in a wide variety of areas, and participation in the complex evolution of a phenomenon we call “culture.” This involves learning to collaborate, to identify, address, and solve problems, and to manage time and energy. We consider these to be vital characteristics of articulate, well-informed citizens of a world characterized by ever-increasing complexity. And we see arts students as uniquely positioned to be world-citizens: perceiving the world through the lens of creative activity helps students come to a deeper understanding of what makes us who we are, individually and collectively, and what it means to be part of the dense and challenging social fabric in which they must play a vital part. In fact, CTSA provides a window into the world of the arts to students across the UCI campus. Our classes are attended by scientists, engineers, and computer students. The culture of UCI emphasizes the integral role the arts play in the contemporary world: remember Albert Einstein’s concert-level violin skills and that we owe our rich choice of computer fonts to Steve Jobs’s calligraphy course. As an arts-producing entity CTSA is extraordinarily busy. The School mounts more than 200 student exhibitions, concerts, and performances in an academic year; we bring visiting artists from around the world to the campus to share their expertise with students and the public; hundreds of Orange County K-12 students visit the campus for performances, workshops, and classes; and we partner with an ever-expanding group of arts, cultural, educational, and civic organizations in Orange County and worldwide. Our undergraduate students leave UCI equipped with the skills to become professionals in their chosen fields of art, dance, drama, and music, as performers or behind the scenes as directors and choreographers; costume, scenic, lighting, and sound designers; stage managers; producers and authors. But they are also prepared with the tools to take other directions: our students become doctors, lawyers, teachers, researchers, etc. The graduate students who complete our M.F.A. programs go on to professional careers on Broadway and in film and television, in major dance companies, showing in galleries, and performing on recordings and with orchestras and ensembles worldwide. Our doctoral students work at the highest levels of academia and beyond. CTSA participates in and contributes centrally to the development of intellectual depth, breadth, and curiosity, providing a firm foundation for our students to go in any direction they may choose. We see this not merely as training but as a kind of liberation—a freedom from constraints and a framework for passionate interaction with the world. If we have accomplished this, we’ve served our students well. With that kind of preparation, the sky’s the limit. “Conversations with the Vice Provost” Vice Provost Michael Dennin interviews Steven Barker, Dean of the Claire Trevor School of the Arts. They speak about the growth of the Arts at UCI, and the importance of Art's relevance to entertain and engage people.